For the steamship, see SS Fatih. For the name, see Fatih (name). For the education project, see Fatih project. Fatih, historically Constantinople, is the capital district and a municipality (belediye) in Istanbul, Turkey which hosts the provincial authorities, including the governor's office, police headquarters, and metropolitan municipality while encompassing the peninsula coinciding with old Constantinople. In 2009, the district of Eminönü, which had been a separate municipality located at the tip of the peninsula, was merged into Fatih due to the minute amount of inhabitants in the prior. Fatih borders the Golden Horn to the north and the Sea of Marmara to the south, while the Western border is demarked by the Theodosian wall and in the east by the Bosphorus Strait. 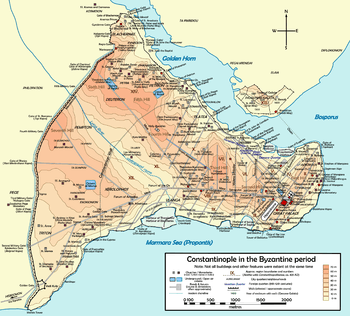 Historic Byzantine districts encompassed by present-day Fatih include: Exokiónion, Aurelianae, Xerólophos, ta Eleuthérou, Helenianae, ta Dalmatoú, Sígma, Psamátheia, ta Katakalón, Paradeísion, ta Olympíou, ta Kýrou, Peghé, Rhéghion, ta Elebíchou, Leomákellon, ta Dexiokrátous, Petríon or Pétra, Phanàrion, Exi Mármara (Altımermer), Philopátion, Deúteron and Vlachernaí. The name "Fatih" comes from the Ottoman emperor Fatih Sultan Mehmed (Mehmed the Conqueror), and means "Conqueror" in Turkish, originally from Arabic. The Fatih Mosque built by Mehmed II is in this district, while his resting place is next to the mosque and is much visited. 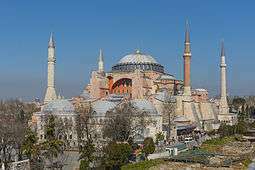 It was on the ruins of the Church of the Holy Apostles, destroyed by earthquakes and years of war, that the Fatih Mosque was built, and around the mosque a large prayer school. 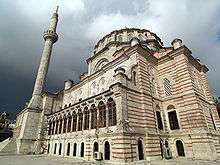 Immediately after the conquest, groups of Islamic scholars transformed the major churches of Hagia Sophia and the Pantocrator (today the Zeyrek Mosque) into mosques, but the Fatih Mosque and its surrounding complex was the first purpose-built Islamic seminary within the city walls. The building of the mosque complex ensured that the area continued to thrive beyond the conquest; markets grew up to support the thousands of workers involved in the building and to supply them with materials, and then to service the students in the seminary. The area quickly became a Turkish neighbourhood with a particularly pious character due to the seminary. Some of this piety has endured until today. 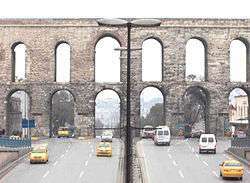 Following the conquest, the Edirnekapı (meaning Edirne Gate) gate in the city walls became the major exit to Thrace, and this rejuvenated the neighbourhoods overlooking the Golden Horn. The Fatih Mosque was on the road to Edirnekapı and the Fatih district became the most populous area of the city in the early Ottoman period and in the 16th century more mosques and markets were built in this area, including: Iskender Pasha Mosque, once famous as a centre for the Naqshbandi order in Turkey); Hirka-i-Sharif Mosque, which houses the cloak of the Prophet Muhammad (The Mosque is in common use but the cloak is only on show during the month of Ramadan; the Jerrahi Tekke; The Sunbul Efendi Tekke and the Ramazan Efendi Tekke both in the Kocamustafapaşa district and the Vefa Kilise Mosque, originally a Byzantine church. The last four were named after the founders of various Sufi orders, and Sheikh Ebü’l Vefa in particular was of major importance in the city and was very fond of Fatih. 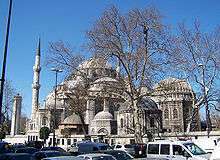 Many other mosques, schools, baths, and fountains in the area were built by military leaders and officials in the Ottoman court. From the 18th century onwards, Istanbul started to grow outside the walls, and then began the transformation of Fatih into the heavily residential district, dominated by concrete apartment housing, that it remains today. This process was accelerated over the years by fires which destroyed whole neighbourhoods of wooden houses, and a major earthquake in 1766, which destroyed the Fatih Mosque and many of the surrounding buildings (subsequently rebuilt). Fires continued to ravage the old city, and the wide roads that run through the area today are a legacy of all that burning. There are few wooden buildings left in Fatih today, although right up until the 1960s, the area was covered with narrow streets of wooden buildings. Nowadays, the district is largely made up of narrow streets with tightly-packed 5- or 6-floor apartment buildings. At present, Fatih contains areas including Aksaray, Fındıkzade, Çapa, and Vatan Caddesi that are more cosmopolitan than the conservative image which the district has in the eyes of many people. With Eminönü, which was again officially a part of the Fatih district until 1928, and with its historical Byzantine walls, conquered by Mehmed II, Fatih is the "real" Istanbul of the old times, before the recent enlargement of the city that began in the 19th century. The area has become more and more crowded from the 1960s onwards, and a large portion of the middle-class residents have moved to the Anatolian side and other parts of the city. Fatih today is largely a working-class district, but being a previously wealthy area, it is well-resourced, with a more thoroughly established community than the newly built areas such as Bağcılar or Esenler to the west, which are almost entirely inhabited by post-1980s migrants who came to the city in desperate circumstances. Fatih was built with some degree of central planning by the municipality. Istanbul University which was founded in 1453 is in Fatih. In addition, since 1586, the Orthodox Christian Patriarchate of Constantinople has had its headquarters in the relatively modest Church of St. George in the Fener neighborhood of Fatih. Fatih has many theatres, including the famous Reşat Nuri Sahnesi. The area is well-served with a number of schools, hospitals and public amenities in general. A number of Istanbul's longest-established hospitals are in Fatih, including the Istanbul University teaching hospitals of Çapa and Cerrahpaşa, the Haseki Public Hospital, the Samatya Public Hospital, and the Vakıf Gureba Public Hospital. A tramway runs from the docks at Sirkeci, through Sultanahmet, and finally to Aksaray, which is a part of Fatih. Also, besides the headquarters, some main units of the Istanbul Metropolitan Municipality, including the city's fire department, are based in Fatih. Fatih has many historic and modern libraries, including the Edirnekapı Halk Kütüphanesi, Fener Rum Patrikhanesi Kütüphanesi (the Library of the Patriarchate), Hekimoğlu Ali Paşa Halk Kütüphanesi, İstanbul University Library, İstanbul University Cerrahpaşa Tıp Fakültesi Kütüphanesi, İstanbul Üniversitesi Kardiyoloji Ensitütüsü Kütüphanesi, İstanbul Üniversitesi Tıp Fakültesi Hulusi Behçet Kitaplığı, İstanbul Büyükşehir Belediyesi Kadın Eserleri Kütüphanesi, Millet Kütüphanesi, Mizah Kütüphanesi, Murat Molla Halk Kütüphanesi, Ragıppaşa Kütüphanesi, and Yusufpaşa Halk Kütüphanesi. On the other hand, today Fatih is known as one of the most conservative but peaceful religious areas of Istanbul because of the religious residents of the Çarşamba quarter which is essentially a very minor part of this historical district. Çarşamba is famous with bearded men in heavy coats, the traditional baggy 'shalwar' trousers and Islamic turban; while women dressed in full black gowns are a common sight as this area is popular with members of the Naqshbandi Sufi order affiliated to a Sheikh. Conservative political parties always do well in this area. Fatih – the central district around the mosque itself. Horhor – a steeply climbing street from Aksaray up to the main street of Fatih. Has some university buildings, and some well-known kebab restaurants. Karagümrük – a working-class neighbourhood famous for its hoodlums and the hooligans of its lower-league football team. Fistikagacı – lies roughly between Fatih proper and the crowded residential area of Koca Mustafa Paşa (near the Marmara shore), very popular with Istanbul University students. Vatan Caddesi – a major road of not only Fatih but also Istanbul, out of the old city to the bus station at Esenler and on to the motorways to Europe. Home to Istanbul's Central Police HQ, (which also issues resident permits to foreigners). Balat – Fatih's neighbourhood on the banks of the Golden Horn, with once grand but now narrow impoverished streets. Formerly a centre of Istanbul's Jewish population. It is listed by UNESCO as a World Heritage Site. Fener – it is often confused with Balat as they situated side by side. The Ecumenical Patriarchate is located here. It was formerly one of the major centres of Istanbul's Greek population, known as the Phanariotes. Samatya – up until recently was mostly inhabited by Armenians. One of the most picturesque fish markets of Istanbul is located here. Eminönü part of Fatih has many historical mosques and buildings, many of Istanbul's best-known landmarks. Recent development has improved Eminönü greatly and many of its winding streets which can at first seem imposing, have been developed and improved, while Eminönü has started to repair the many mosques. Yeni Cami (The new mosque) – the mosque that dominates the waterfront by the Galata Bridge; there is a wide open space in front where people feed the pigeons. Grand Bazaar – as much to look at as to shop in. Sokollu Mehmet Pasha Mosque – in Kadirga District (the Byzantine Sophianòn Limin in Greek). The tombs of some of the famous sultans, including Mehmed II 'the Conqueror' (Fatih Sultan Mehmed) and Selim I (Yavuz Sultan Selim) as well as other leading statesmen of the Ottoman Empire, including Gazi Osman Pasha are in Fatih.And has a great collection of different cuisines(Turkish,Syrian,Korean,Indian). Wikimedia Commons has media related to Fatih.